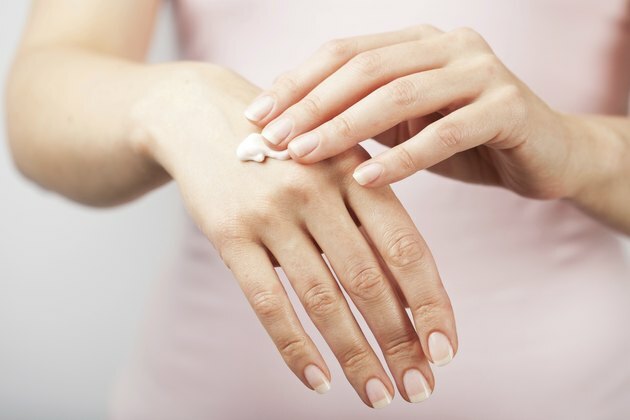 Dry skin on the fingertips can be caused by many different factors. Skin on the fingertips may be dry and flaky, or in severe cases, cracking or peeling. There are several reasons that you may develop dry skin on the fingertips. Some potential causes include allergies, eczema, dehydration, vitamin deficiency and environmental exposure. Finding the underlying cause can help you treat the condition. Dry skin on the fingers can be related to the weather. The winter months are particularly harsh on the skin. Besides being exposed to the wind and cold, your skin is also exposed to dry air indoors caused by heating systems. To prevent dry skin, you should always wear gloves when exposed to the elements and use a moisturizing lotion on your hands on a daily basis. The lotion should contain either glycolic or lactic acid, both of which can exfoliate dry, dead skin. Dehydration is one of the causes of dry skin on the fingertips. Drink plenty of water to keep the skin moist and supple. Consistent exposure to harsh cleaning chemicals and disinfectants may dry out the skin on the fingertip area. Avoid products with added fragrances in products like dish soap, cosmetics, detergent and fabric softener. When handling these types of products, gloves should be worn. Exposure to very hot water also tends to dry out the skin. In addition, a deficiency in vitamin A can cause dry skin, according to the Merck website. Eat plenty of carrots, papaya, fortified milk, fortified cereal, pumpkin and squash to increase your vitamin A intake. Eczema is a chronic skin condition that is characterized by itchy rashes. It can appear on the fingers of a sufferer. The skin can become dry and cracked and may even start to ooze pus. Avoid scratching, because this may make the rash worse. Certain clothing, such as wool gloves, can irritate an outbreak of eczema on the fingertips. Instead, use cotton gloves during an outbreak. You may be advised by your doctor to apply a small amount of hydrocortisone cream to the fingertips to control symptoms caused by eczema. The cream should contain at least one percent hydrocortisone. Allergies to latex, talc and nickel can cause dry skin when you expose your fingertips to these materials, according to QuickCare.org. If you use latex gloves and the skin becomes irritated and dry on your fingertips, switch to a latex-free version to see if the condition clears up.